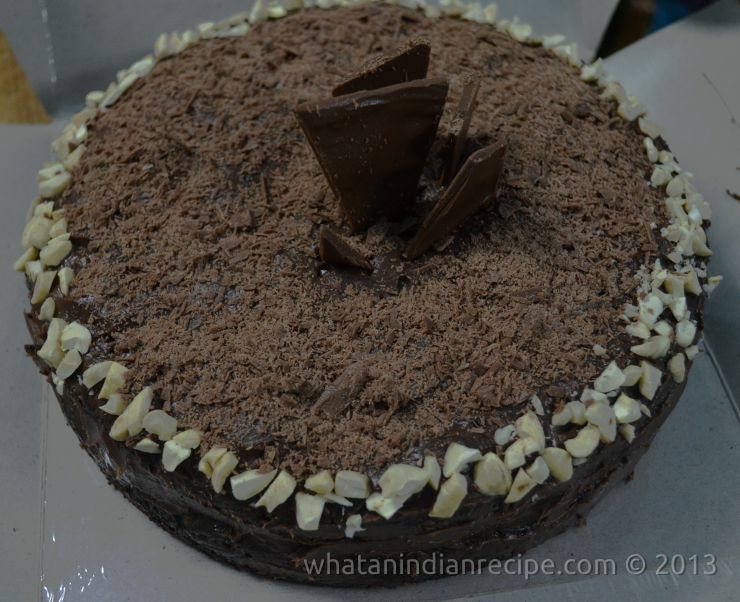 Ganache is a glaze, icing, sauce, or filling for pastries made from chocolate and cream, for the details of preparation of Ganache follow this recipe. Sift the flour, sugar , baking soda and cocoa powder . To this add oil and beat well. Then add the water and beat again. Finally add the essence and mix well. Preheat oven and pour the cake batter in a large greased baking tin and bake at 180° c for 30-35 minutes. Take it out of the oven and slice the cake into two horizontally to make 2 layered cake. (you can also bake two cakes by dividing the cake batter if you have a smaller baking tin). Spread the ganache on top of one layer and then place the other layer on top of it , Finally cover the cake with the remaining Ganache and decorate it with soma chocolate flakes and nuts.